There are various activity in the four seasons in here Norkura Kogen and we are moved by beautiful nature of each seasons. Summer is beautiful green season to enjoy hiking and cycling in the leafy Japanese alps. Mountaineering season and Sun rise bus is started. Beautiful autumn color is coming. Autumn color is started from alpine area and will move to the Highland area gradually with taking about 1 month from the end of sept to the end of Oct. Skiing, snowboarding and backcountry at the best powder snow in Honsyu. 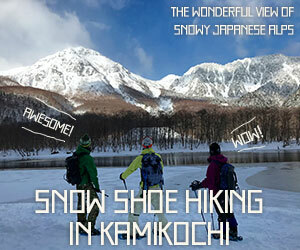 Also Norikura is best snowshoeing field. There are ice falls and small beautiful pond in Norikura Kogen.